A young lady who regularly attends our mother/daughter stamp class is having a birthday party on Saturday and I am lucky enough to be invited! She told me that she likes sock monkeys, so I thought I would make up a little gift set for her. 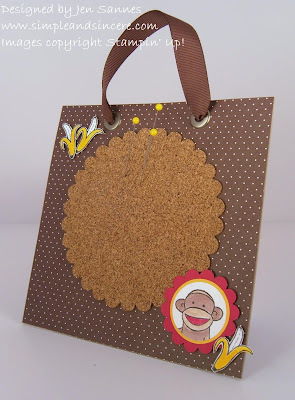 I got the idea for this mini bulletin board from Karla Anders and Rachel Durtschi. They demo'd a similar project at one of their Big Shot classes and I thought it was so clever! This is a little brag book that the birthday girl can use to put all of the fab pictures of her friends from her party (or whenever!). 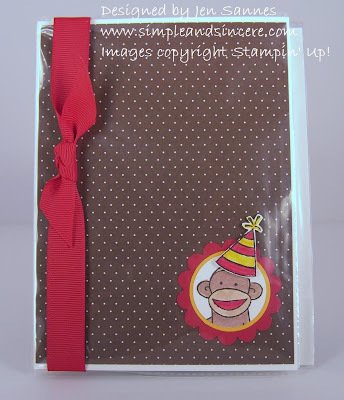 I love that little sock monkey - he's so cheeky! Both of these projects were pretty quick to put together and I had all of the supplies on hand, except for the cork. Read on to find out more about the supplies. See you back soon!